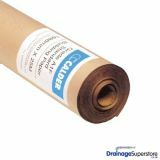 Here at Drainage Superstore we are proud to offer a range of different lead underlays, specifically designed for lead work. Lead underlay is a roll of material that is fixed before installing leadwork or lead roofing. Building paper underlay can be used on smooth substrates such as plywood, smooth concrete and natural stone, to prevent free alkali being released and attacking lead sheeting. If working in a moisture prone area, you can opt for moisture resistant lead paper underlay, preventing moisture from affecting the lead roofing. 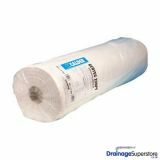 We also have a range of Geotec underlay, which has been manufactured to be most suitable for use on traditional timber board. It has been designed to prevent ridges and fractures forming within the lead sheet due to thermal movement. Why do you need lead underlay? Lead underlay has a range of benefits, and we’d recommend using it when undertaking lead roofing work. Firstly, the underlay provides you with a smooth and even surface to work on, meaning that there are no rough edges, nails sticking out, or knots in wood. It also protects the lead against corrosion from stone or concrete, and can help reduce condensation which can cause major problems in roofing. Additionally, lead underlay creates a barrier between the lead sheet and the substrate, meaning that thermal movement can occur without causing major issues or lead dragging.